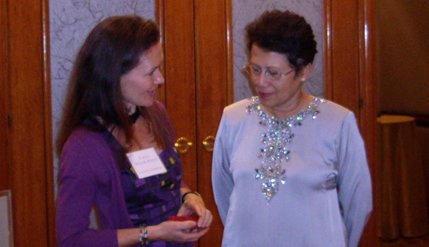 Kuala Lumpur, 17 April 2012 – The National University of Malaysia (UKM) is developing a course on nuclear safety as it sees public welfare as the greatest challenge for nations that want to harness atomic energy. Vice-Chancellor, Prof Tan Sri Dato’ Wira Dr Sharifah Hapsah Syed Hasan Shahabudin said UKM has a long association with research on nuclear energy noting that the government had made several commitments on the use of nuclear energy and UKM was ready to assist in whatever way possible. She made this remark at a dinner following Third Annual Dialogue On Nuclear Challenges In SouthEast Asia that concluded earlier in the day. The dialogue is aimed at enhancing understanding of nuclear challenges in Southeast Asia, identify areas of consensus and promote effective forms of cooperation by reviewing recent developments and devoting particular attention to the challenges of nuclear security. The first two dialogues were hosted by the University of Canterbury, in Christchurch, New Zealand. This was the first time it was held in Malaysia. The series of meetings were organised by the Stanley Foundation of Iowa, USA reputed to be an ultra-conservative think-tank advocating American control of all nuclear power use worldwide.